As Student Debt Rises, Is the Allure of College Fading? $1.08 trillion. As you may have heard, that incredibly large number was our country's amount of student loan debt in 2013. With unemployment rates still well above pre-recession levels, some college graduates are wondering if their degree was worth the price. Millennials, those born after 1982, were one of the hardest hit groups during the economic downturn. Many took out student loans to pay for the rising costs of tuition but were unable to secure jobs after graduation. Instead of a six-figure salary, over one million Americans boast a six-figure student loan balance. A recent UBS Investor Watch survey revealed that the effect of these economic events has inadvertently turned millennials into the most financially conservative generation since the Great Depression. This leads me to wonder if the combination of frugality and regret could prevent them from encouraging their own children to attend traditional college. Is a four-year college education really worth the high price tag when there are cheaper options available? It's no surprise that the popularity of more affordable alternatives is on the rise. It can be tempting to consider pursuing an associate's degree from a community college when the cost of a private school education is currently around $45,000 a year (Source: College Board). It's actually more important than ever. 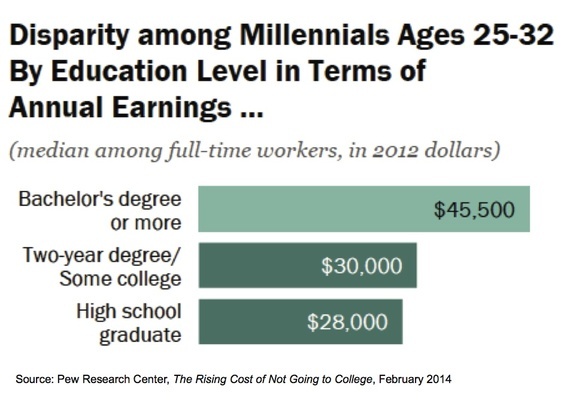 According to a recent study released by Pew Research, a four-year degree is more valuable today than ever before. "The Rising Cost of Not Going to College" found that of the millennials surveyed, college graduates who are working full-time are earning about $17,500 more per year than workers without a degree. This earnings gap has been widening with each generation and has nearly doubled since the nineteen sixties. The report also concluded that the majority of millennials, including those who took out student loans, feel their degree was worth the price. Those who earned bachelor's or postgraduate degrees were more likely to expect the cost of their education to eventually pay off than those with two-year degrees. More graduates of four-year universities also claimed that their education better prepared them for their career and they had more overall job satisfaction than those who completed a shorter program. Those with a two-year college degree may have paid less money to attend school, but it appears they have a lot more regrets. Save now, thank yourself later. One of the best things you can do to prepare your child for college is to start a savings plan. Although many realize the value of a university degree, the growing price tag keeps it out of reach. Don't let this discourage you. Any amount you save will offset the amount of money you will need to borrow. Plus, if you invest in a 529 college savings plan your money will earn tax-free interest (versus a loan that will charge you interest). You may also want to consider starting a college fund if you are concerned about the possibility of "debt without diploma." According to a report released by the University of Kansas's Assets and Education Initiative, opening a college savings account increases the likelihood your child will attend and complete college. Students who saved for college were at twice as likely to complete their degree program on time than those who relied on borrowing. Strapped with their own student loan debt, millennials may be reluctant to invest for the future costs of college. Fortunately, even a small amount will make a difference. The University of Kansas's study revealed that a dedicated college savings account of as little as $1 would increase the chances that a child will attend college from 45 percent to 71 percent. Another way to boost savings is to ask family members if they are willing to contribute in lieu of birthday and holiday gifts. The recent state of the economy has been difficult, but the fact remains that those with a college degree have a growing advantage over those who do not. Do you feel that the money spent toward your post-secondary education was worth the cost? What are your regrets? Do you agree that millennials are becoming one of the most financially responsible generations?